HONDA VFR 1200F is one of the World’s best Sport Tourers. The bike has been recently launched in India. A good news for all bike enthusiasts in the country. But the worrying aspect is the price of the bike, which is uncommonly very high. However, the bike can be described as the “ultimate road sport machine”. HONDA VFR 1200F is available in two colors – Seal Silver Metallic and Candy Prominence Red. The fused cowl and body provide an aerodynamic surface to the bike. The broad headlights, sleek taillights and rear indicators are very stylish. HONDA VFR 1200F has many comfort features for the rider. The self start bike has Digital Fuel Gauge, Analogue Tacho Meter, Digital-1 Trip Meter, and Digital Speedometer. Other comfort features include Pass Light, Low Fuel Indicator, Low Oil Indicator, Low Battery Indicator, High Oil Temperature Indicator and Choked Air Filter Indicator. 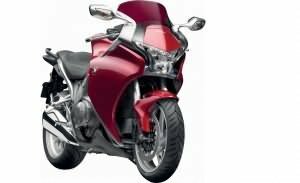 HONDA VFR 1200F scores a point over other bikes as far as safety aspect is concerned. The bike has 43mm cartridge fork (Front) Suspension and Pro Arm Single Side Swing arm (Rear) Suspension. The braking system is instant and sharp. The bike has 320 mm (Front) disc brakes with CBS and 276 mm single disc with CBS (Rear) brake. HONDA VFR 1200F consists of 1237 cc, Fuel Injected, Liquid cooled, compact V-4 engine. It produces a maximum power of 172 BHP at 10000 rpm and a maximum torque of 129 Nm at 8750 rpm. It sports 6 speed gearbox. The bike has Dual Clutch Automatic Transmission. 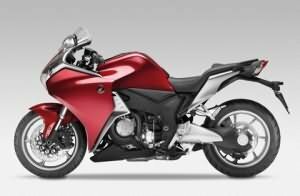 The price of HONDA VFR 1200F is Rs. 17,50,000 (taking Mumbai as base price location). However, the price specified is indicative price only and reflects lowest approximate price which excludes tax, registration, insurance and cost of accessories.